The below article was originally published in our Spring/Summer 2016 issue of knit.wear. It speaks directly to the method of lace grafting, and addresses the Anna Cowl pattern, pictured above. In the article, I show how the lace pattern for the Anna cowl is formed as each row of the Lace chart is worked during the knitting process. Then, I show how this process is recreated when the stitches are grafted. On Sunday, I will show you a capelet from Interweave Knits Winter 2017 that I made for my daughter. The capelet was worked from side to side in a lace pattern and was grafted, making the capelet look beautiful from any angle. The Anna Cowl by Sarah Wilson begins with a provisional cast-on, a type of cast-on that leaves the loops at the base of the cast-on row live (open) so they can be used again (either by working another piece in the opposite direction from the first piece or by joining the cast-on loops to other live loops using a three-needle bind-off or grafting). In this case, the live loops at the top of the cowl (the last row worked) were grafted to the live loops at the base of the provisional cast-on row to join the cowl into a seamless circle. Grafting is a method of joining live stitches using a tapestry needle and a strand of working yarn. A grafted join is invisible because it mimics the stitch pattern of the pieces that it joins (especially if the two pieces have the same knitting direction, as they do in the Anna Cowl). Of course, in order to maintain this continuity of pattern, the grafting must be done correctly. Grafting is an interesting (and sometimes challenging) technique because each stitch is created by drawing the yarn in and out of a stitch on the knitting needle in a certain way, depending on the type of stitch. And each stitch pattern has its own unique combination of steps. Because the stitch pattern in the cowl is a garter–stitch–based lace pattern, the grafting must contain these elements as well. A stockinette stitch graft is simpler to execute, but it will interrupt the pattern (just as it would if you randomly worked a couple of rows of stockinette stitch while working in the lace pattern). In this article, I’ll describe how the lace pattern in the cowl is formed as each successive pattern row is worked, beginning with the provisional cast-on row and ending with the last pattern row worked before grafting. Then I’ll look at how the pattern is maintained when the stitches are grafted. To keep things simple, the illustrations show just a small portion of the lace pattern (eight stitches and seven rows). 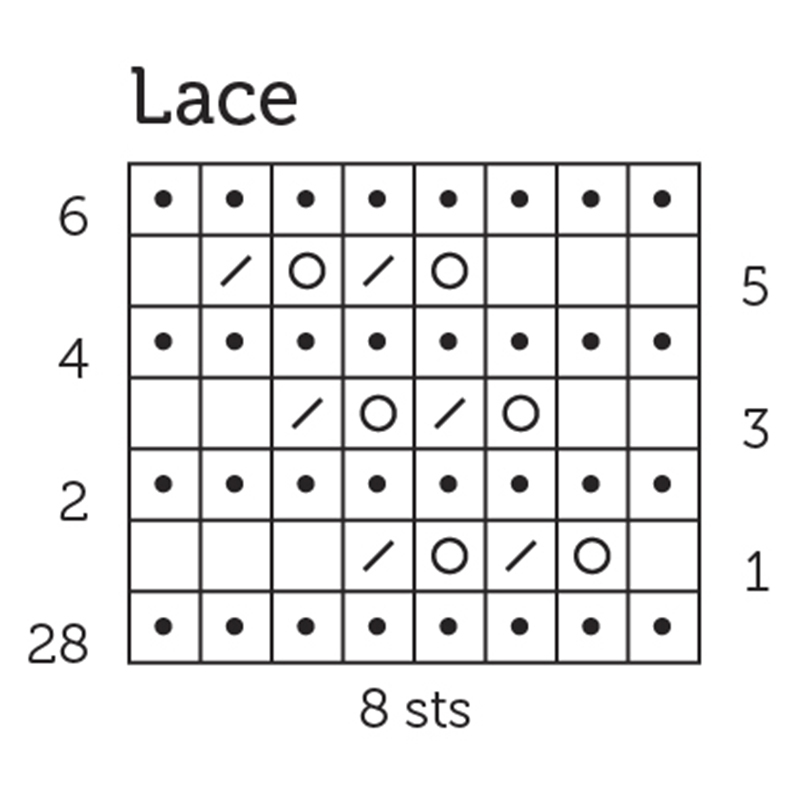 The corresponding section of the Lace chart below (a portion of the full chart) will give you an idea of the relationship between the charted pattern and the knitted fabric. I’ve purposely omitted both the waste yarn and the knitting needle from the illustrations so they don’t distract from what’s happening with the working-yarn stitches. I also made the rows that are worked on the wrong side red to make it easier to differentiate them from the right-side rows. In addition, this makes it easier to see the effect that working a pattern row has on the row below it. All the illustrations show the right side (the public side) of the work. 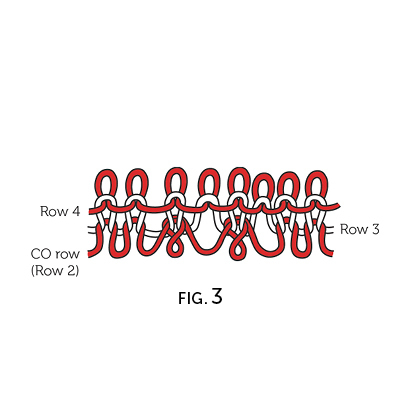 Simply put, a provisional cast-on is a series of working-yarn loops that have been secured temporarily at the base with waste yarn (or even a circular needle) instead of being permanently secured with working yarn (as are most cast-ons). (Note that this means that the cast-on isn’t finished until there are working-yarn stitches on the needle, not waste-yarn stitches.) 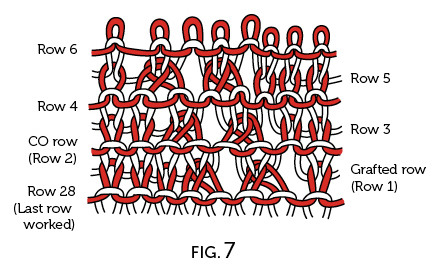 Figure 1 shows a provisional cast-on without the waste yarn or knitting needle depicted. Notice that loops run along both the top and the base of the row. There are eight loops on the top of the row and seven loops (plus a half loop at each edge) at the base of the row. Loops 1–8 at the top of the cast-on row are the loops that sit on the knitting needle. Loops 1–7 at the base will eventually be placed on another needle in preparation for grafting after the waste yarn is removed. There is one fewer loop at the base of the row because these loops fall between the loops at the top of the row. 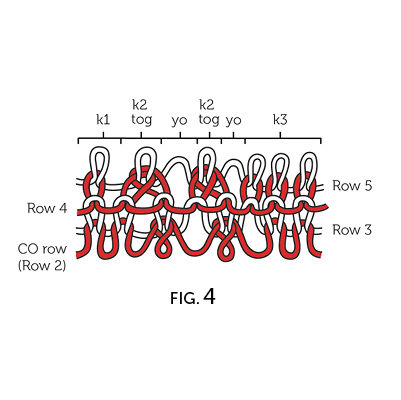 The half loop at the right-hand edge of the row is created when the working yarn is drawn up to the row that immediately follows the cast-on row. Knitters often use this half loop to bring the number of cast-on loops back up to the original cast-on number. If you are going to be working in the opposite direction from the first piece, the pattern of the second piece will be offset by a half stitch from the pattern of the first piece. This offset may or may not be noticeable, depending on the stitch pattern. However, if you are grafting live stitches to the provisional cast-on, there shouldn’t be any offset because the knitting direction of both pieces is the same, and the stitches on the front needle will align vertically with the stitches on the cast-on row. Of course, you could still end up with a jog in the pattern if you don’t align the stitches on the front and back needles correctly. The easiest way to ensure that the stitches will be properly aligned is to use the half loops at the edges to anchor the first and last grafted stitches. When the stitches are grafted, the tops of the stitches on the front needle will be joined to the base of each stitch on the cast-on row. Therefore, each loop on the front needle needs to match up with two half loops on the back needle. 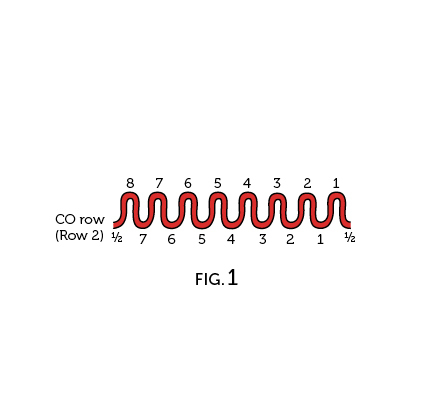 In Figure 1, the half loop to the left of loop seven on the base of the row is actually the cast-on tail and not a loop at all. You will need to create a loop by threading the cast-on tail onto a tapestry needle and circling around the knitting needle before drawing it through a stitch on the selvedge edge to the wrong side of the work. Every row of the cowl (including the provisional cast-on row and the grafted row) corresponds to a row of the chart. The grafted row counts as chart Row 1 and the cast-on row counts as Row 2. Therefore, in order for the pattern to be continuous, the lace pattern needs to begin with Row 3 after the stitches are cast on and end with Row 28 after the cowl has been worked to the desired length. At the moment, the cast-on row doesn’t look like Row 2, which is worked by knitting on the wrong side to create a purl ridge on the right side of the work. This purl ridge isn’t visible yet because the cast-on row doesn’t intersect with another pattern row below it. When the stitches are grafted, the purl ridge will be created by drawing the working yarn through the loops at the base of the cast-on. You can cast on provisionally a few different ways. One of my favorite methods (and the one we call for in the cowl pattern) is the crochet-chain method. Using a crochet hook and waste yarn, crochet a chain a few stitches longer than the number of stitches you need to cast on. Then, using the knitting needle and working yarn, pick up and knit the number of stitches you need to cast on, working along the back of the chain. A variation of this method is to work the waste-yarn chain directly onto the knitting needle and then knit across the waste-yarn stitches with the working yarn. If you use this method, don’t make the mistake of stopping after the waste-yarn chain stitches are on the needle because the cast-on is not complete until the working-yarn loops are on the needle. You could also purl across the waste-yarn stitches. 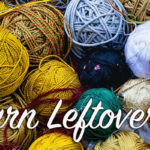 It really doesn’t matter because once the waste yarn is removed, any knit or purl stitches are going to disappear, and you’ll be left with open loops. For this reason, it’s not necessary to work a pattern row directly over the waste yarn stitches. And if the pattern row consists of a combination of knit and purl stitches, you’ll find it more difficult to remove the chain because you’ll have to cut it at each transition between a knit and a purl stitch. When chart Row 3 is worked, it has a pretty dramatic effect on the cast-on row (Figure 2). Two loops have been combined where k2tog decreases were worked, and there are gaps where yarnovers were worked. In Figure 3, chart Row 4 has been worked on the wrong side, creating a purl ridge on the right side of the work. 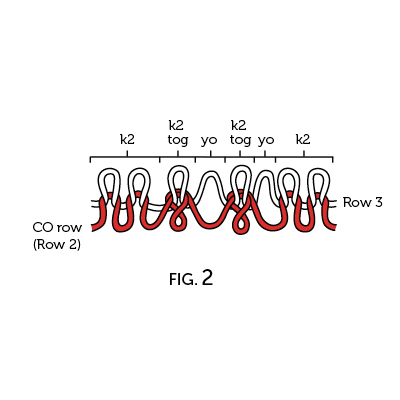 When Row 5 is worked (Figure 4), the effect of working k2tog decreases and yarnovers is the same as when Row 3 was worked over the cast-on row. You can see the pattern begin to emerge, with the yarnovers and decreases shifted one stitch to the left in relation to those on Row 3. Because every wrong-side row is the same (an all-knit row), Row 6 has the same effect on the right side of the work as Row 4 (Figure 5). To re-create the purl ridge on the back needle, the steps will always be worked the same way: by inserting the tapestry needle knitwise into the first stitch (removing the stitch from the needle), then purlwise into the next stitch (leaving the stitch on the needle). On the grafted row (Row 1 of the chart), the decreases, yarnovers, and knit stitches must be re-created on the front needle. Each knit stitch is created by inserting the tapestry needle into the same stitch purlwise (leaving the stitch on the needle) and knitwise (removing the stitch from the needle). Each decrease is created by inserting the tapestry needle purlwise into two stitches at the same time, then knitwise into the same two stitches. And each yarnover is created by skipping the front needle steps altogether (just working the back needle steps). 1. Into the stitch(es) on the front needle, leaving the stitch(es) on the needle. 2. Into the stitch on the back needle, removing the stitch from the needle. 3. Into the next stitch on the back needle, leaving the stitch on the needle. 4. Into the stitch(es) on the front needle, removing the stitch(es) from the needle. 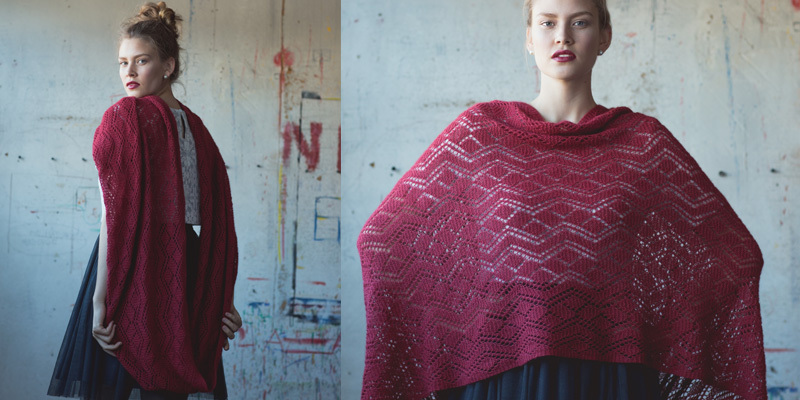 The lace pattern used in the cowl requires three different sequences: Sequence A (creating a knit stitch on the front needle and a purl stitch on the back needle), Sequence B (creating a yarnover on the front needle and a purl stitch on the back needle), and Sequence C (creating a k2tog on the front needle and a purl stitch on the back needle). The specific steps that are required for working each sequence are included in the pattern. For the eight stitches from chart Row 1 that appear in the illustrations, the sequences need to be worked in order as follows: Sequence A once, [Sequence B once, Sequence C once] 2 times, Sequence A 3 times. As you can see, grafting in pattern creates a seamless continuation of the stitch pattern across the joined rows. And it really isn’t hard to do. We make it even easier by providing step-by-step instructions. Even if you’ve never grafted before, you have a perfect opportunity to gain a new skill and add a bit of polish to your project.